How to convert WMV to iTunes video format on Mac? Current Page: Home > tutorials > How to convert WMV to iTunes video format on Mac? iTunes Mac supports video formats such as MOV, MP4 and M4V. In order to import WMV files into iTunes Library, you need to convert WMV to iTunes compatible video format first. It is very easy and fast to convert WMV to iTunes MOV, convert WMV to iTunes M4V or convert WMV to MP4 on Mac for transferring to iTunes Library using Clone2Go WMV to iTunes Converter for Mac. Download the latest version of WMV to iTunes Converter for Mac, install and run it. Click the "Add Files" button to import the WMV files stored on your Macintosh HD. Then you can get the video information in the manager panel. After the WMV files are imported, go to the "Output" panel. Click the "Profile" drop-down list to choose the format that iTunes supports. 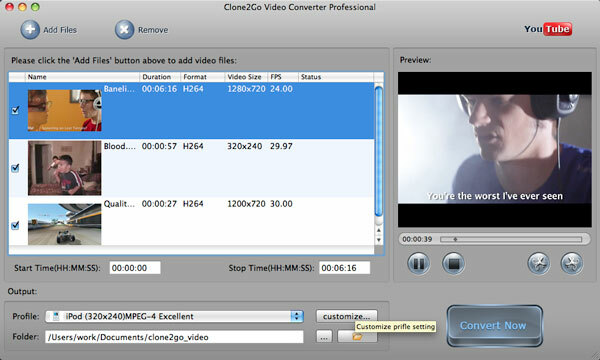 Here, you may choose "Customized MP4 Movie (*.mp4)" as the output video format. When all settings are done, click the "Convert Now" button to start convert WMV to iTunes format.